The Owl P82 Dual Gel System is one of the easiest systems to run and produces flat even banding and crisp resolution. The system can run two (W x L) 10 x 10 cm gels or one single gel when used with a blocking plate. The design allows gels to easily be placed into the device. A wedge is placed in front of the cassette(s) providing even pressure against the leak proof gasket and places the cassette(s) in the proper running position. Two sizes of wedges are provided to accommodate varying thickness of precast gels. No cooling is required. Ships complete with Upper Buffer Chamber (UBC), Lower Buffer Chamber (LBC), SuperSafe Lid with Attached Power Supply Leads, 2 Wedges (1.27 cm Thick), 2 Wedges (1.59 cm Thick). This system will accommodate (L x W) 10 x 8 cm gels utilizing the provided adapter. Use the JGC-4 Gel Casting System or P7-CST Gradient Gel Caster to create gels for this system. Part Number JGC-4. 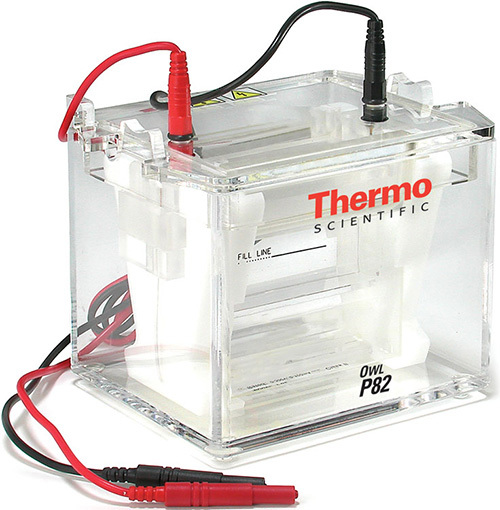 The Owl JGC-4 Gel Casting System offers a unique and novel way to cast polyacrylamide gels. A pouch is used to collect the excess polyacrylimide and seal the bottom of the gel. The "pouch" system eliminates the need for tape or bottom spacers. Part Number P7-CST. The Owl P7-CST Gradient Gel Caster is one of the more simple devices you can use to cast gradient gels. With an external gradient maker, gels can be cast with ease and great reproducibility.